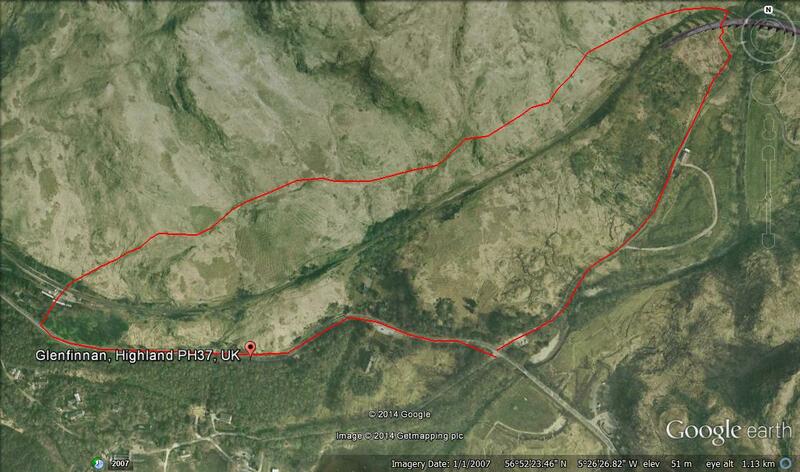 Walking conditions – Mainly tarmac road and track. The stretch along the footpath can be quite muddy in places, particularly after heavy rain. No difficulties. Time required – Around 2 to 3.5 hours. Travelling on the A830 from Fort William to Mallaig is perhaps one of the most magnificent stretches of road in Scotland. Seven miles shy of Mallaig lies the picture postcard village of Arisaig. This is a place my wife has been raving about for years on account of a family holiday where she stayed there as a child. 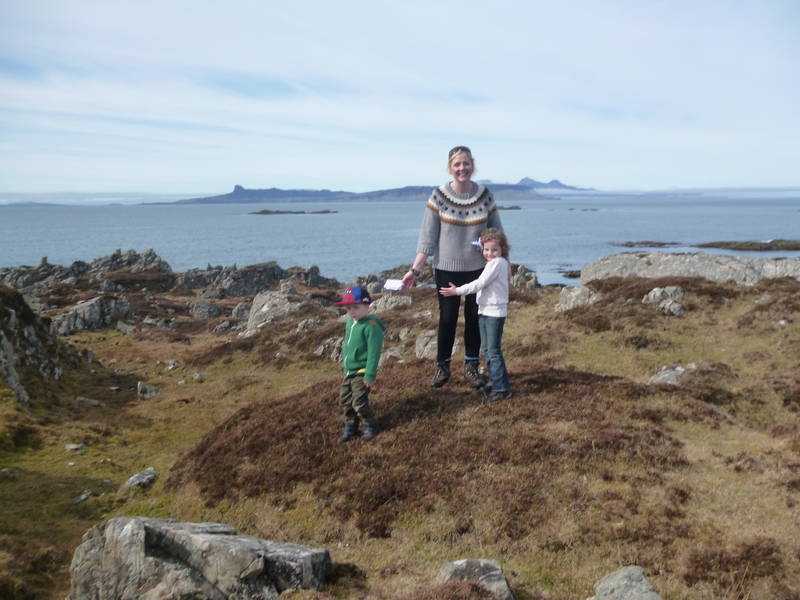 Nostalgia is not necessary for being blown away by the walk from Arisaig to Port na Murrach. Indeed, any moans or complaints about the walk being a little muddy in places, cease to be heard the minute you walk onto the beach. 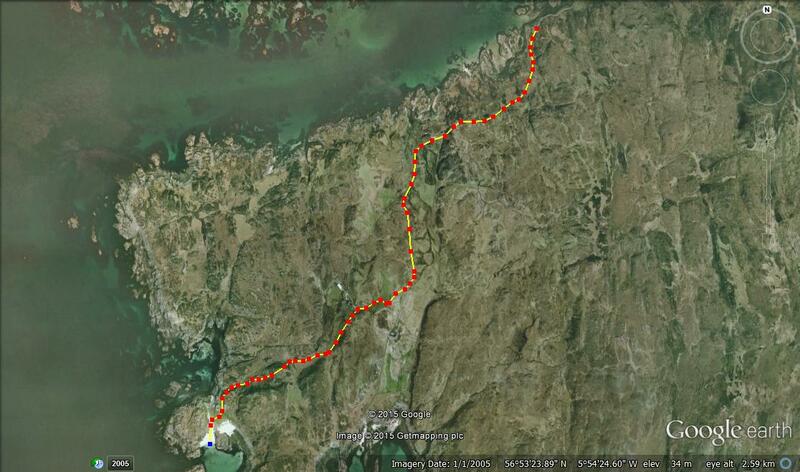 From Arisaig, drive along the single track road signposted ‘Rhu’ to the parking spot at the end of the public road. From there walk along the private road/track for about 1.4 kilometres. At that point you will reach a private house with a sign pointing to the footpath on the left. This footpath leads past a hut and along a stone dyke. Due to the movement of livestock this can be particularly muddy. It only lasts for about one hundred metres then the going gets easier, although still muddy in places. Keep following this path until you drop down a rocky outcrop onto one of the most idyllic and picturesque beaches you are ever likely to see, with golden sand transported here from Mexico by the Gulf Stream. Make sure you have brought a map so you can identify all the islands and rock features which you see before you. Return via the same route. 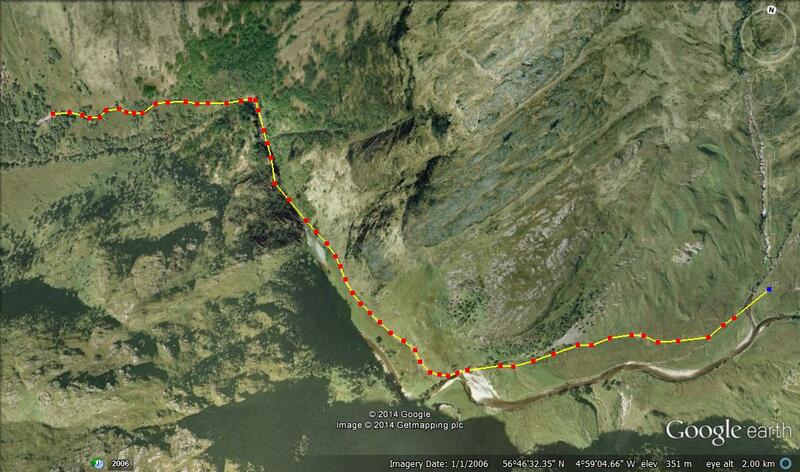 Oh, and if you go on a Sunday make sure you’ve got enough petrol because it’s a long way back to Fort William. 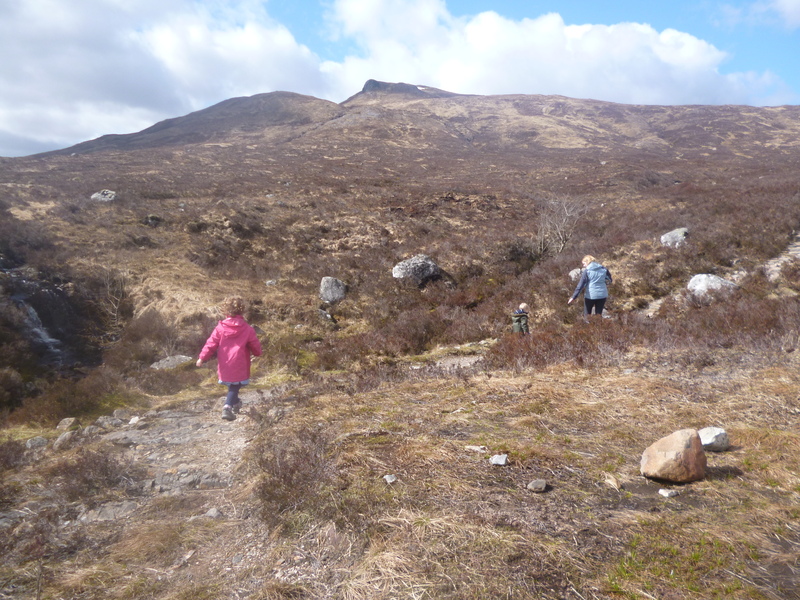 This entry was posted in West Highlands and Argyll on April 10, 2015 by scotlandwalkswithchildren. Walking conditions – Well defined footpath. Steady incline. No difficulties. We’re quite well connected. We’ve got friends who own a caravan at Drimsynie, Lochgoilhead, and on one occasion they even let us use it. What a brilliant three days it was. One of our many highlights was our walk up to the ‘Steeple’. Seldom has a 390 metre ascent been more rewarding. 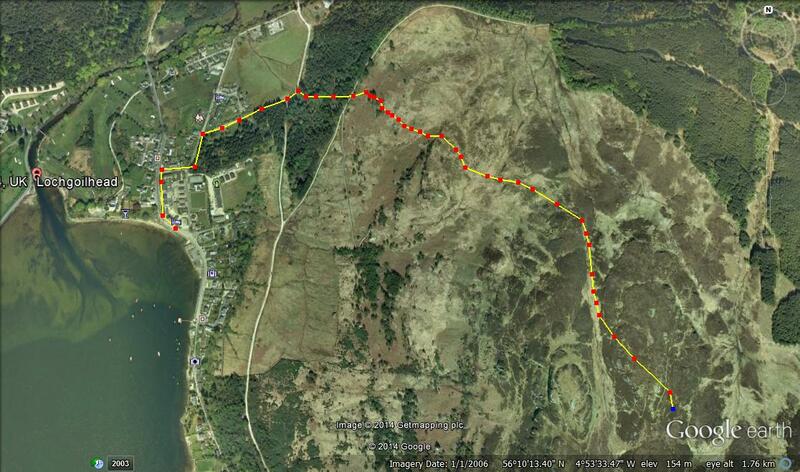 Begin your walk from the car park in Lochgoilhead. Head towards the forest in a north to north-east direction and pretty soon you’ll come to the forest path. The path is clearly marked and takes you through the trees, onto the open ground and steadily winds its way up the grassy shoulder of the hill until you reach the top. Absolutely magnificent! 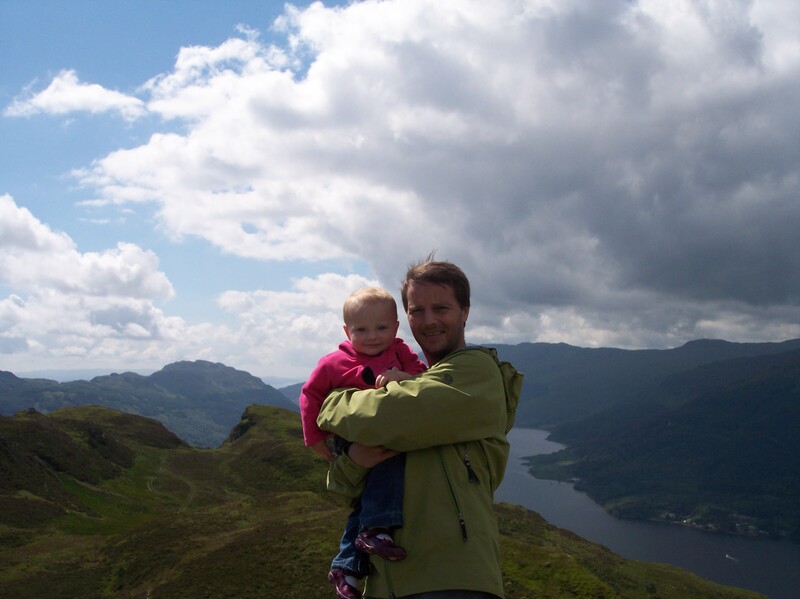 A superb view of Loch Goil awaits you along with other sea lochs and the Firth of Clyde. That is, unless you happen to be gazing across Loch Lomond and the Trossachs. Return via the same route. On the way home we stopped for dinner at Creggan’s Inn, Strachur. It was a slight deviation but well worth it. 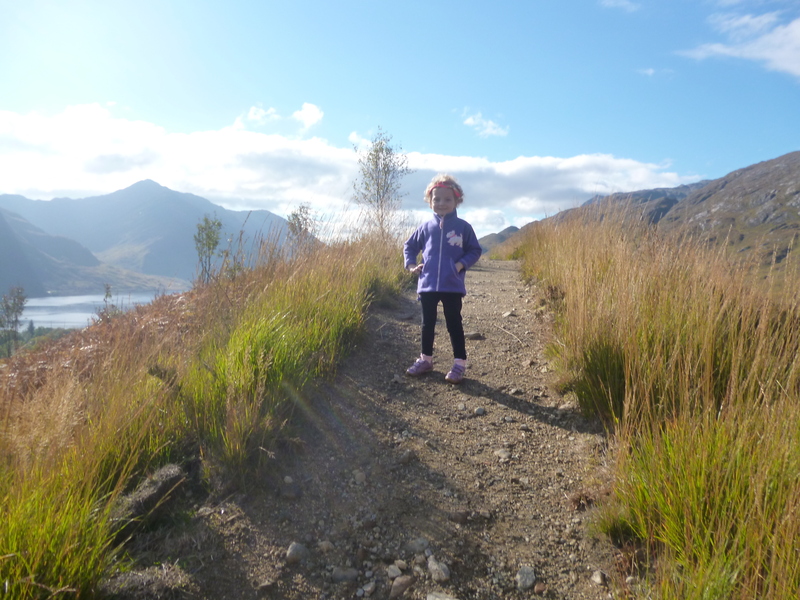 This entry was posted in West Highlands and Argyll on October 7, 2014 by scotlandwalkswithchildren. Dangerous and exhausting are two things you might expect from a place in Glen Coe called The Devil’s Staircase. Surprisingly, The Devil’s Staircase is actually a safe and easy winding walk that offers some truly magnificent views over the West Highlands. It was named not by outdoor enthusiasts but by General Wade’s road building soldiers who were lugging materials up and down it all day. Evidently, they did not share our enthusiasm for this stretch of land. The whole exercise is a straight-forward undertaking. It should take you well under one hour to reach the top of the Devil’s Staircase. Park at Altnafeadh on the A82, directly across from Buachaille Etive Mor. 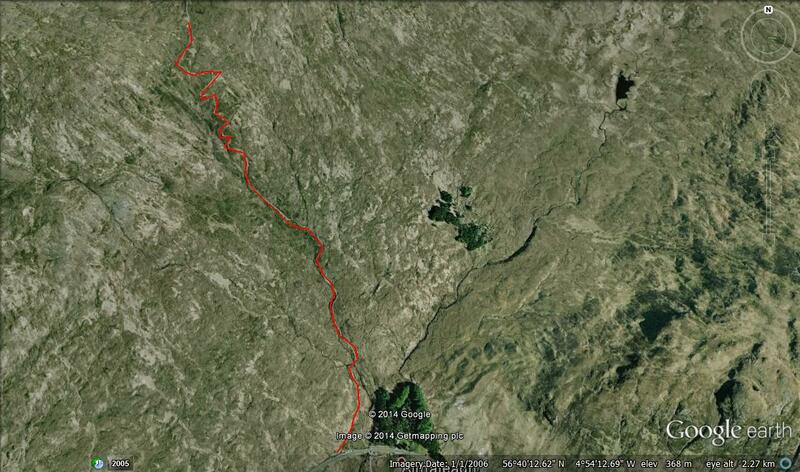 Take the West Highland Way footpath (travelling roughly NNW). You will find this path right next to the parking bay. Simply follow the footpath as it winds its way up the 250 metre ascent of The Devil’s Staircase. At the top of the Devil’s Staircase there is a bealach marked by two large cairns. 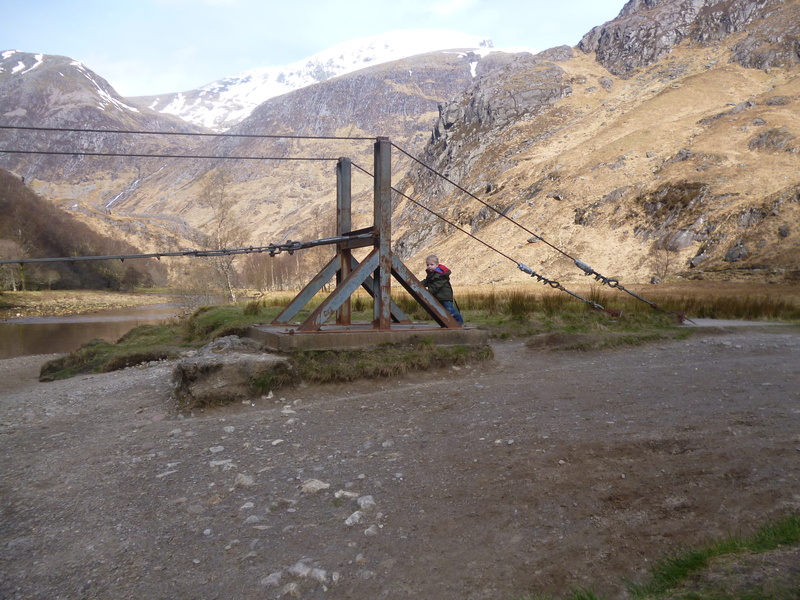 This is an ideal picnic spot with a fantastic view of the Mamores. Take plenty of time to identify some of the best mountains in Scotland and at the same time cheer on the West Highland Way walkers, as to them, the Devil’s staircase was indeed aptly named by General Wade’s soldiers. Return by the same route. This entry was posted in West Highlands and Argyll and tagged glen coe walks, west highland way on August 16, 2014 by scotlandwalkswithchildren.